I can't believe tomorrow is the last day of 2017. The years keep going by so quick! I hope you all had a wonderful Christmas, and that you'll have a marvelous New Year! It's time for another Short & Sweet Saturday card! I used one of the upcoming Sale-A-Bration stamp sets, Beautiful Peacock. You'll be able to get this stamp set free with a $50 order (before shipping & tax) beginning this Wednesday, January 3, 2018! I wasn't sure if I was going to like this stamp set, but I really do! I also wasn't sure if I was going to like Pumpkin Pie with Pool Party and Lemon Lime Twist. When I finished the card, I found out that I LOVE these colors together! The added Pumpkin Pie color really makes card pop! I used the new Tutti-Frutti Adhesive-Backed Sequins on this card. I'm really having fun finding new ways to use these sequins. I'm offering these sequins as my Customer Online Order Thank You Gift. 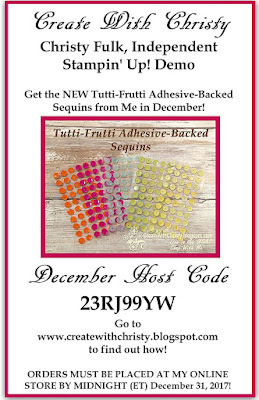 Place a minimum $75 order (before shipping & tax) AND use the Host Code 23RJ99YW at my ONLINE STORE, and I'll mail the sequins to you free in the middle-part of January (separate from your order). I'll also send a thank you card to you. You'll need to hurry, though! The last day to get your order placed is tomorrow, December 31, 2017. CLICK HERE to find out when NOT to use the Host Code and to see the thank you card. 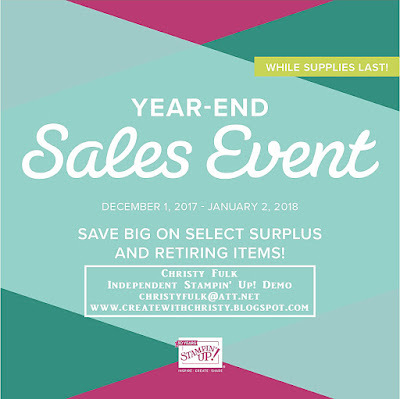 DON'T FORGET THAT THE YEAR-END SALES EVENT ENDS THIS TUESDAY, JANUARY 2, 2018! Petal Garden Designer Series Paper (DSP): 4" x 1-1/2"
Stamp the long, vine-like stamp from the Beautiful Peacock Stamp Set onto the top, right corner of the largest Whisper White piece using the Lemon Lime Twist Classic Stampin' Pad. 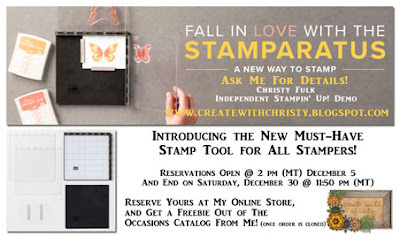 Stamp the shorter vine-like stamp onto the bottom, left corner of the piece using the same ink pad. 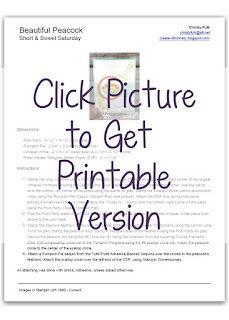 Stamp the smallest flower stamp around both vines using the Pumpkin Pie Classic Stampin' Pad (see picture). Attach the DSP strip across the piece, placing it in-between the two vines. Stamp the "Today is..." stamp onto the bottom, right corner of the piece using the Pool Party Classic Stampin' Pad. Fold the Pool Party piece in half (fold on the left) to form the card base. Attach the Whisper White piece from above to the card base. Stamp the peacock feathers stamp onto the center of the smallest Whisper White piece using the Lemon Lime Twist ink pad. Stamp the peacock body stamp in the open area of the feathers using the Pool Party ink pad. Die-cut the peacock out using the #5 circle die (#1 being the smallest) from the Layering Circles Framelits Dies. Die-cut a scallop circle out of the Pumpkin Pie piece using the #6 scallop circle die. Attach the peacock circle to the center of the scallop circle. Attach a Pumpkin Pie sequin from the Tutti-Frutti Adhesive-Backed Sequins over the circles in the peacock's feathers. Attach the scallop circle over the left end of the DSP, using Stampin' Dimensionals. All attaching was done with SNAIL Adhesive, unless stated otherwise.